A full field of thirty six Professionals and their amateur teams enjoyed a great day at the Martinborough Golf Club today. The professionals scored much better in the benign conditions after battling the blustery windy weather at Paraparaumu Beach yesterday. 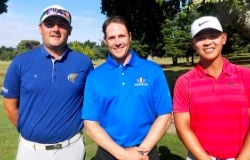 Mark Purser, Luke Kwon and Ryan Chisnall tied for first place in the Spark Business Martinborough Pro-am with rounds of seven under par 65. Mike Hendry, Nathan Kim, Harry Na, Jordan Dasler and Victor Janin all tied for fourth place on 66.